What the Heck is a Chalkie? 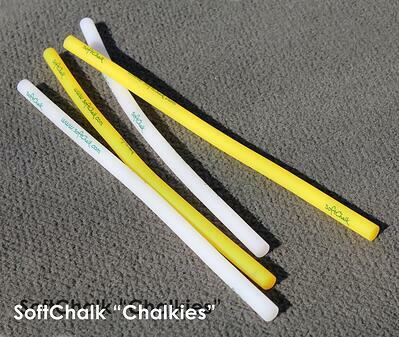 Here at SoftChalk we throw the term "Chalkies" around often. We use it to refer to our employees and sometimes even use it to describe power users of our content authoring solution. But most of time it's used in relation to our famous giveaway - THE CHALKIE. If you've ever visited our booth at a conference than you've probably picked up a piece of our "soft chalk" A.K.A a chalkie. They come in green, yellow and white, they're flexible and about 12" long and 1/2" thick. Sadly they don't glow in the dark, although we certainly wish they did! People have been known to stop at our booth simply to ask what the heck it is and what to do with it. Well today my friends I'm going to let the cat out of the bag. Their main functional use is to ERASE PENCIL. The best part is that they are so big you can give one to your child and she/he will be able to use it from pre-k on to graduate school! Besides erasing, there are several more things you can do with your chalkie. We learn new ideas everyday from our users so here's a few to get you started. Obviously this isn't an all-inclusive list. I am sure there are a ton of other great uses for chalkies that we haven't heard of yet, so leave a comment with the following information - Do you have a chalkie? If so, what do you do with it?